For the first time, the seasoned forces of the crowned stag take to the field of battle to defend their claim to the Iron Throne! 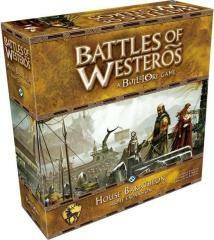 In the House Baratheon Army Expansion for Battles of Westeros, you can unleash the Baratheons' fury with eight mighty commanders and over 100 detailed troop miniatures. An epic battle awaits you on the stunning Blackwater map, and innovative rules for Alliance battles allow up to eight players to clash in the deadliest of conflicts. In order to sleeve your cards for this game, you would need 2 packs of FFGFFS03 - Standard American Board Game Size Sleeves.